The Expo was in the San Jose convention center. I printed the race release and signed it before leaving home. I handed it to a gentleman who handed me the wrong bib. It took him a little while to realize I'm not a man named Kent but I'm so glad he caught his mistake. I was thinking that Kent might be unhappy not to have his personalized bib. The race's bib pick up system is pretty low tech compared to other marathons I've ran but the important thing was to guarantee my precious bib. Once we left that area I got my finisher's shirt. 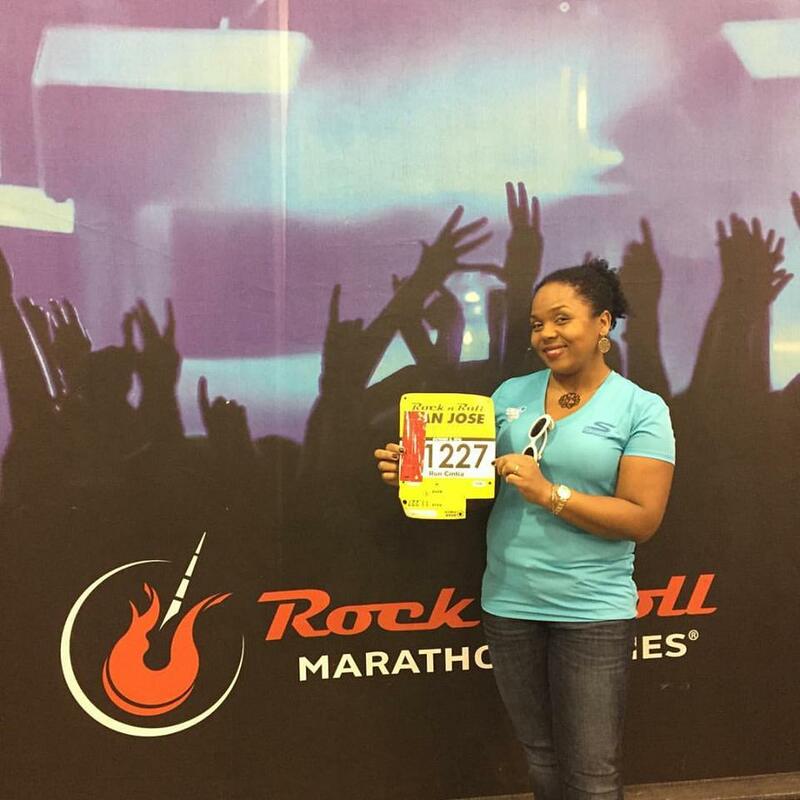 I then took my traditional "I got my bib picture." After that you go to a Brooks type of store filled with running products. I bought a San Jose Half running hat. I always run with hats so I can always use more hats. Once you check out, you go to the area where the other sponsors are. I had fun visiting the booths. I got a personalized suitcase tag from a sponsor and a few samples of Emergen-C. They had teeth whitening chairs, which I thought it was very different. I also found a bunch of the Big Sur race series t-shirts for $5. I didn't buy them because I thought, I didn't earn this so I better not even go there. After the expo we went out to eat (Vegan) and I got to see a few neighborhoods in San Jose. I took my "Flat Cintia" picture and went to sleep early. The race provided free parking two blocks away from the start line. We got there with plenty of time to enjoy the scene and use the bathroom twice. The weather was cool, dreamy running weather. The day of the expo I found the pace group tent and asked about their strategy. They told me they'd run a 11:27 mile starting a bit faster in the beginning. They also showed me the map so I could see where the hills were on the course. I got the 2:30 marathon bracelet from them but decided to stick to my plan. Pace Groups haven't really worked for me yet so I decided to do just run my own race. The reason why I didn't know where the hills on the course it's because I couldn't find an elevation map along with the course map. I found the course to be mostly flat with with a hill on mile 5, one on mile 8 and another on mile 12. I think that the best way to see a city is to run, so the course gave me a great chance to check out San Jose. We started downtown and then we went through several neighborhoods. I saw an Egyptian history museum on the course and a few headquarters. Around mile 11 I ran in front of the San Jose rose garden. Not only could you see the roses but you could smell them from the road! I told myself "smell the roses Cintia" and they smelled so incredibly great! That was the highlight of my run. 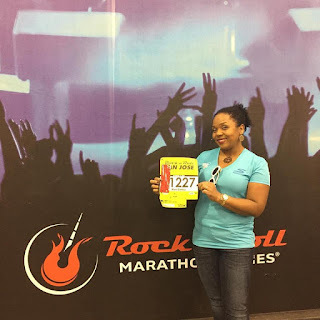 I've been telling you about my training as my goal race is the Chevron Houston Maraton. 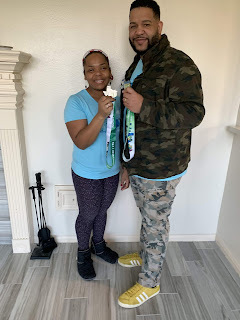 I lost some weight in training for this half marathon. The leaner I am, the easier it is to run long distance. I also added weight training and core training to my schedule. I increased my running days to 4 instead of 3. During my long runs, I ran for one mile and walked one minute. I decided to do the same during the half-marathon in San Jose. Every time I doubted my decision, I quickly convinced myself to stay the course. It paid off! I also did not bring my water bottle to the race. I practiced drinking water every two miles when I was training and I'll be honest and say that I was a bit nervous but every time I was thirsty, there was a water break (around every 2 miles). I brought my trusty clif shots and I was sick of the sweet taste after mile 11. Another thing that influenced this was the fact that I drank Gatorade from the water stations, so that added extra sweetness to my taste. 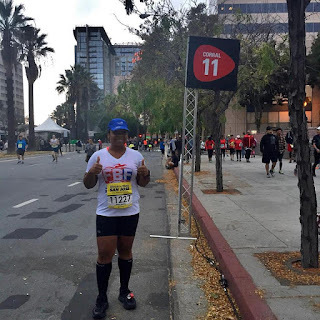 I felt great throughout the race, my energy level never decreased. Oh, I ran headphone-free. I took it with me, but again, I believe in not being over dependent on people or tools in order to cover the miles. I also decided to enjoy the experience to the fullest. The race had so many bands throughout the course, I felt like I really didn't need the extra noise in my ear. I was not sure if it was going to finish the race at my goal time. I was honestly doubting myself (I know!). 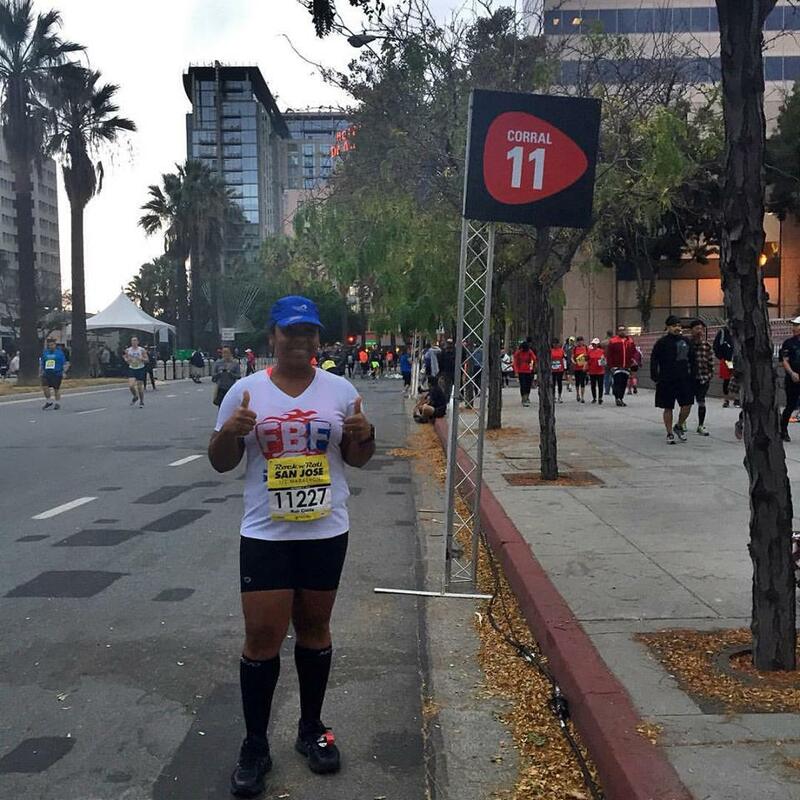 At mile 10, I even told myself "if you don't get to your A goal, you can certainly reach your B goal." The problem is that there was no B goal. 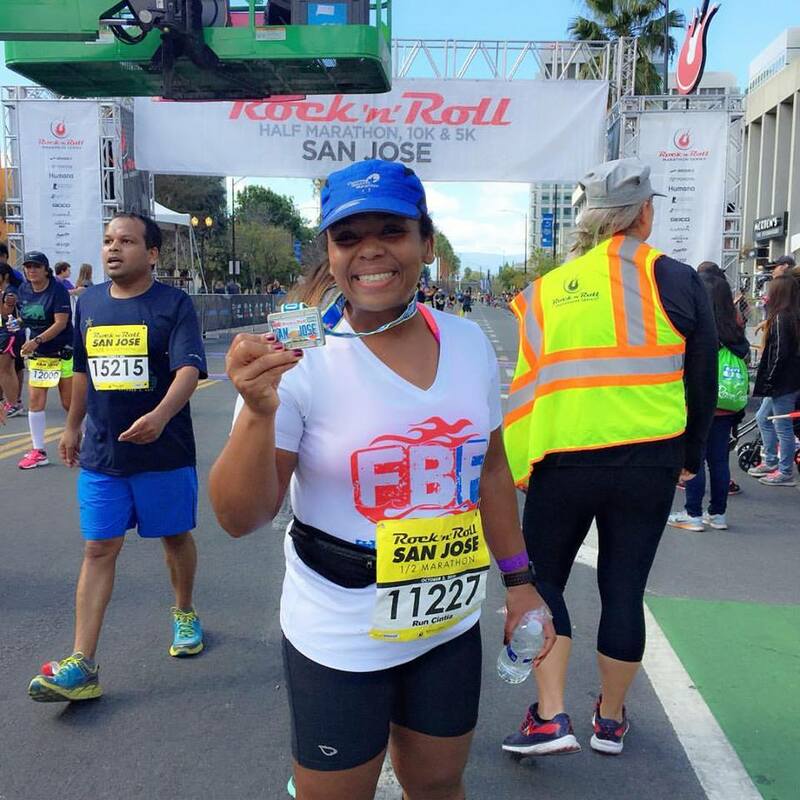 My A goal was to finish injury-free at 2 hours and 30 minutes. I talked myself up so much that there was no other scenario. I saw the 2:30 Pacer pass me and I decided not to let that happen. She told me, "I had to keep my pace but you're faster so keep going. You can do anything for 100 yards, right?" I said "right!" and kept going. 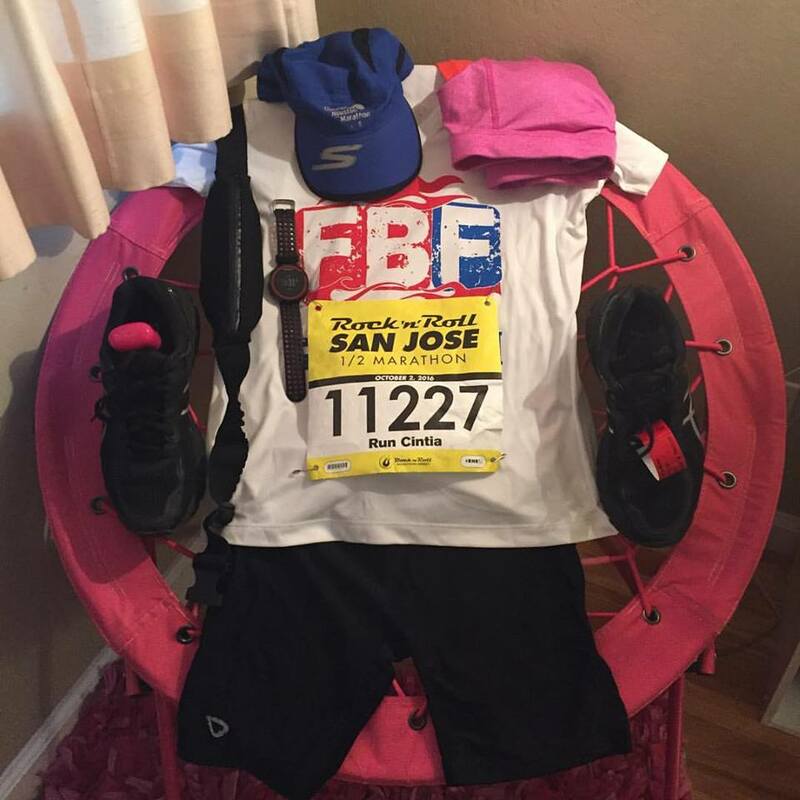 As I got closer to the finish line, I thought about my paternal grandmother and I dedicated my race to her. I thought, "here I am grandma, running my race with perseverance and carrying on your legacy" as soon as that thought left, I reached the finish line. I looked at my text message (yes, I was tracking myself) and it said "Cintia finished in 2:33:55" Oh. My. Word. I have roughly an 18-minute PR! I was so overcome with emotion that I walked right through the medal area. Yes, I quickly went back to claim my bling and get this picture. I grabbed some bread and drank a bit of chocolate milk with it. I wasn't hungry but I know that if I want to feel better I need to eat, stretch and keep moving. I received a big hug from my friend Lea and we walked back to her car, happy and thankful to God for such a great day. I ate super healthy foods while in Cali so recovery has been great. I noticed that my shoulders and neck are not as sore as before because I was not carrying my water bottle. I put on my compression socks and today I am back to training with an easy run and core training. My next race is the first of 3 Houston Marathon warm-up series. It's another half which I plan on running on marathon pace. It also means that if everything goes according to plan, I should have another PR. 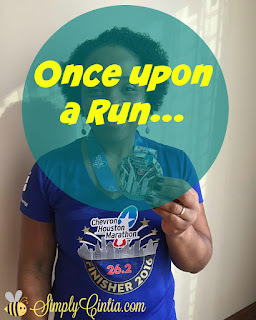 My aim is not to become the PR queen, but to become the person I know I am: someone who decided not to have a race repeat effect for years and years but someone who will be consistent with training, nutrition and rest. When I checked my messages later that Sunday, my mom reminded me that my paternal grandmother passed 3 years ago that day. Funny how Vo Maria's memory was so strong when I finished the race. My goal is to continue to honor her as I live boldly for Jesus, just as she wisely taught me. I hope you enjoyed this update! Have a marvelous day and thanks for joining me in this journey. • The Chevron Houston Marathon is SOLD OUT but you can still run for Charity.